The Bulgari Art Award for contemporary painting has enabled the Gallery to acquire an exceptional work by Michael Zavros for our permanent collection. 'The new Round Room' is a meticulously detailed oil on canvas of the interior of the Grand Trianon in the grounds of the Palace of Versailles. It exhibits both Zavros' exceptional technical facility and his fascination with the cultural achievements of the European aristocracy and the French ancien régime - the buildings, gardens and interiors created with unlimited wealth and power. The Trianon was designed by Jules Hardouin Mansart in close consultation with Louis XIV as a smaller palace from which to escape the pomp and formality of the court at Versailles. The room itself is an exquisite and intact 17th century vestibule to the Grand Apartment occupied by Louis XIV for just three years from 1688 to 1691. Zavros has painted a view from inside the room looking out through a window to the famous formal gardens which surround the Trianon. The details of the lavish interior have been painted by Zavros: the inlaid floor of black, white and mottled brown marble, panelled walls, columns framing the window embrasure, the large chandelier and elaborate later Napoleonic period torcheres. Strikingly positioned in front of the window however is a weight lifting bench, in one surreal juxtaposition Zavros has turned this historic room into a contemporary gymnasium. 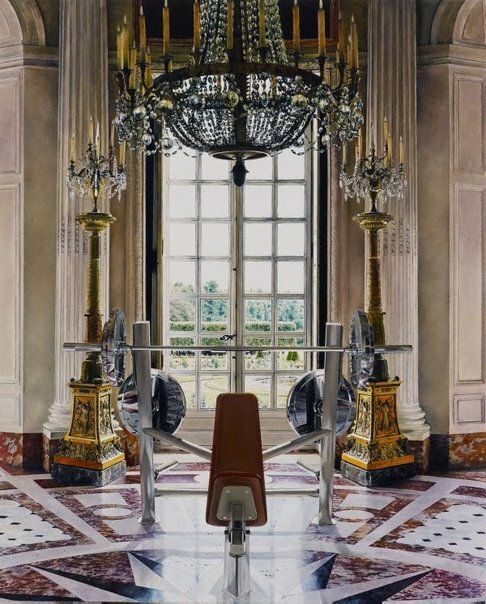 The placement of the gym equipment in this setting suggests the painting is also a contemplation of narcissism and desire, of vanity and even vanitas, of the passing of time and human beauty. There is no one bench pressing weights, but the equipment awaits a user and suggests a contemporary pursuit of physical perfection which has echoes in the earlier pursuit of architectural perfection in the building and the human perfection of nature in the highly cultivated gardens. Signed and dated l.r. corner, red/pink oil "MZ [monogram] 12". Robin Amadie, Wentworth Courier , 'Bulgari Art Award Dinner', pg. 34, Sydney, 25 Jul 2012, 34. Zavros is pictured standing in front of the painting. Patricia Anderson, Australian art review , 'Bulgari: a celebration of perfection', pg. 30-32, New South Wales, Sep 2012-Oct 2012, 30 (colour illus. ), 32. Jon Cattapan, ARTAND Australia , 'The creative mix', pg. 57-59, Sydney, Aug 2013-Oct 2013, 58 (colour illus.). Andrew Hornery, The Sydney Morning Herald , 'Worth weights', pg. 28, Sydney, 21 Jul 2012-22 Jul 2012, 28. Matthew Westwood, The Australian , 'Painter's 'folly' is worth the weights', pg. 15, Canberra, 20 Jul 2012, 15 (colour illus.). Zavros is pictured standing in front of the painting. Michael Zavros, The Australian , 'I don't want blood oozing out of the walls', pg. 15, Canberra, 20 Jul 2012, 15. The Sydney Morning Herald , 'For a fit king' in The Diary, pg. 16, Sydney, 20 Jul 2012, 15 (colour illus.). Zavros is pictured standing in front of the painting. Art Monthly Australia , 'Contents', pg. 1, Canberra, Aug 2012, cover (colour illus. ), 1 (colour illus. ).